The Dampchaser® is the perfect low cost solution for protecting your clothes shoes and possessions from the damaging effects of mold, mildew dampness and corrosion. Just fit it and forget it and let the Dampchaser® do its work. It comes complete with simple mounting hardware, a 1.8 meter power cord and plug. The Dampchaser® is mounted horizontally in the lower half of the cupboard / closet creating a gentle background warmth that circulates throughout. It reduces allergens and helps eliminate damp musty odorous. Ideal in wardrobes and closets, or for creating and airing cupboard. 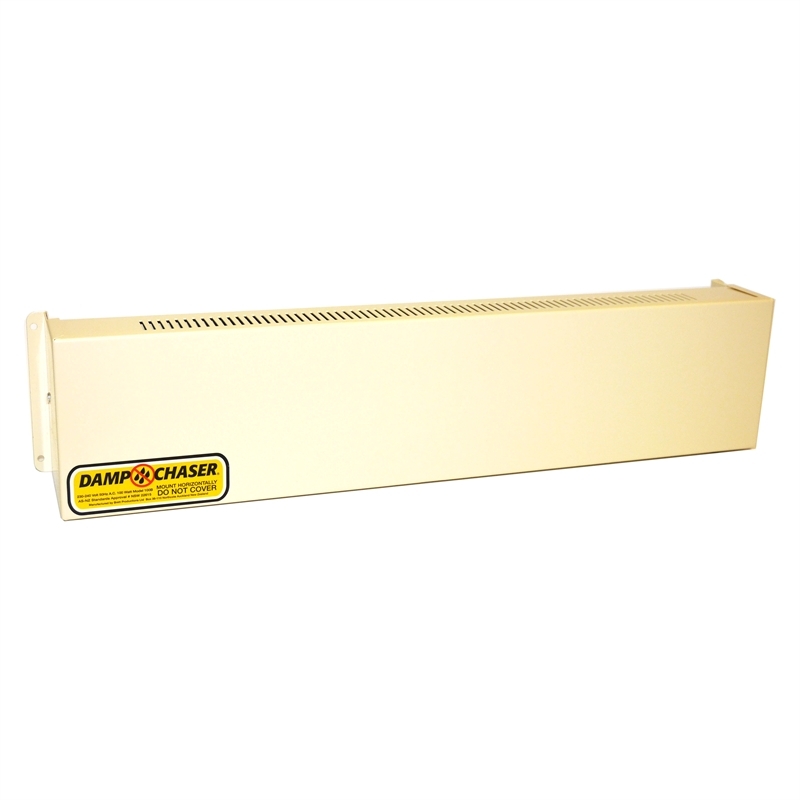 The Dampchaser® has a multitude of uses around the home and work place, and can be used in boats, basements, storage lockers, drying cabinets, gun safes, animal enclosures, small rooms, caravans, electrical switchboards, plant propagating rooms and in sporting equipment lockers etc. The 100 Watt model is ideal for creating an airing cupboard or for larger double wardrobes of approximately 5 to 6 cubic meters. Fabricated in steal and powder coated in a durable cream colour. 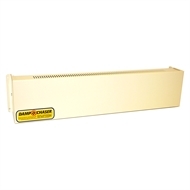 Your DAMPCHASER cupboard heater is guaranteed to be free from defects in materials and workmanship for a period of two years from the date of original purchase provided it has been operated and installed in accordance with the manufacturer’s instructions. The manufacturer will repair or replace free of charge any defective part. This guarantee is void if the Dampchaser® or its component parts are modified, tampered with, or damaged through accident, negligence, alteration, or misapplication. The associated costs of removal and replacement of this product are not covered by this warranty. In the unlikely event this product needs repair or replacement; please return it from whom it was purchased or to your local authorized agent. Please retain your purchase receipt for proof of purchase when making a claim under the terms of this warranty. You may also have other statutory rights. Mounting: The Dampchaser should be mounted HORIZONTALLY on a wall with the grill facing up or down. Either way round is OK allowing a minimum of 100mm or 4 inches of free space above and below it.